The Mountain Mods - Pedestal acts as a separate chamber underneath your existing U2-UFO or Ascension. 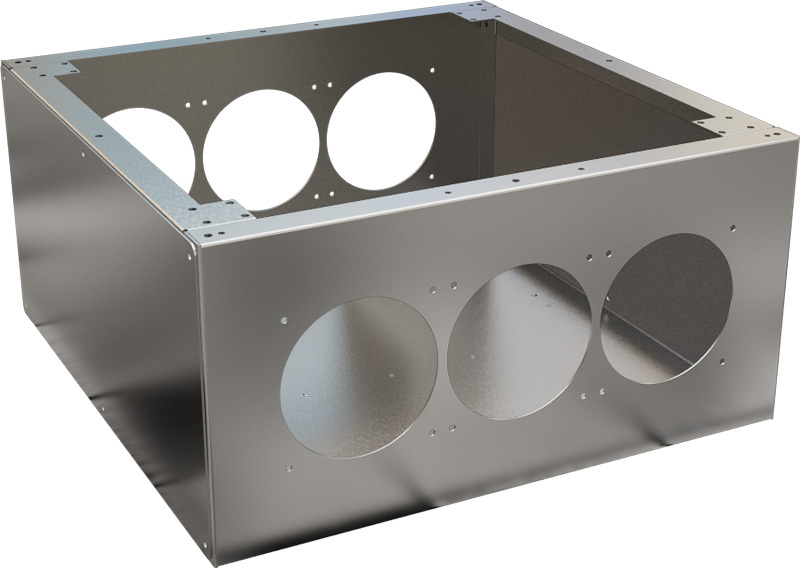 Choose from a variety of options for radiator mounting and additional 5.25 bays. This chamber is a perfect way to isolate the water cooling components from your valuable hardware or a great and easy way to introduce a phase changing solution into your cooling. Choose from 2 available bottom panels and a variety of front and side panels. One bottom panel - "Smiley" has cutouts for cable, tubing, or phase connections to pass between your existing case into the Pedestal. If your U2-UFO is of the "Hyper Modular" design or if you have an Ascension which are all of "Hyper Modular" design you can choose the "Smiley" or the "Solid" if you choose to put in your own cutouts. For older U2-UFO's that are not modular, you will need to cut out your own pass through holes in the bottom of your existing case. If your case is not "Hyper Modular" you will also need to drill new mounting holes for attaching the old unit to the Pedestal. For cases that are "Hyper Modular" you can simply attach the Pedestal by putting a 6-32 screw where you would normally have casters or feet and tightening them into the struts of the pedestal below. The Pedestal can be stacked in multiples or the individual struts will allow you to use with U2-UFO or Ascensions for multiple stacking of U2-UFO's or Ascensions. Build your own tower of Babylon!